Detail of a Ziggurat, from Sinturbanizam, 1964. Vjenceslav Richter (1917, Drenova, Croatia - 2003, Zagreb, Croatia) earned his degree in architecture at the Technical Faculty in Zagreb in 1949. He is one of the founders of Exat 51 (1951), Studio of Industrial Design (1956) and the Centre for Industrial Design (1963) in Zagreb. Richter headed the Architecture Department at the Academy of Applied Arts in Zagreb (1950-1954). In all his activities, from designing the exhibition spaces Pavilion for the World Exhibition in Brussels 1958 and Triennale of Milan in 1964, to painting, Richter carried out the principle of artistic synthesis. 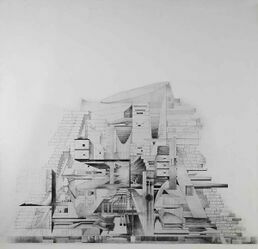 Beginning in the early 1960s he developed a systematic approach to urban planning (sinturbanizam) and sculpture (system sculpture), from the 1970s in print works, and from the 1980s in system painting. Richter also created acknowledged stage set designs for major opera and theater performances. The Philosophy of the Improbable, 1997. This page was last modified on 3 December 2017, at 21:28. This page has been accessed 5,272 times.